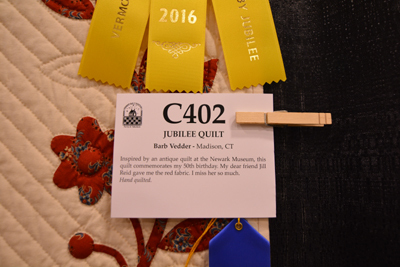 I have been slow to blog as I had to take a week off to rest up before and after our annual event, attending The Vermont Quilt Festival, June 24-26th. It is where I get an overdose of inspiration, enough to last a whole year. This year we went on Sunday, which is good in that it isn't so crowded, but not so good as it closed earlier than we remembered, and we were cut short. 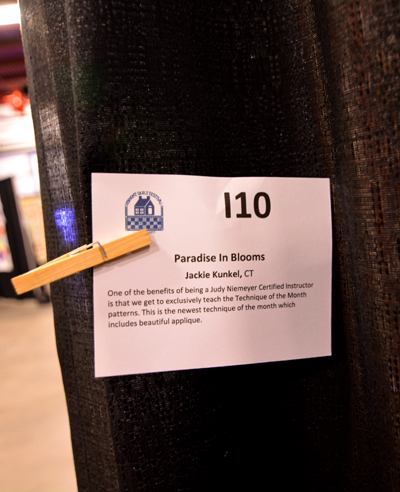 Fortunately, my husband considers the show a challenging and rewarding subject for him to photograph each year. 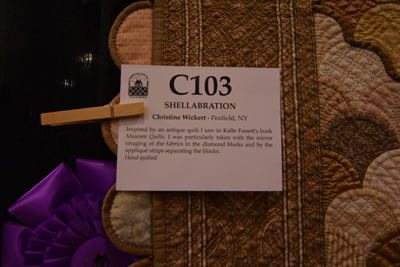 My stamina is less than stellar and so I can enjoy the quilt show throughout the whole year through his pictures. 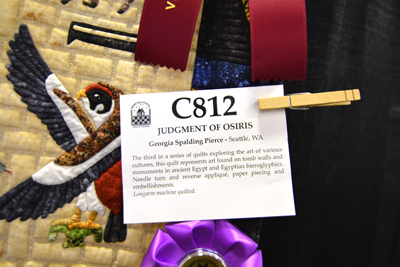 He has taught me that any of his photographs can be blown up to better capture the technical aspects of each quilt, truly a worthy study for any quilter! 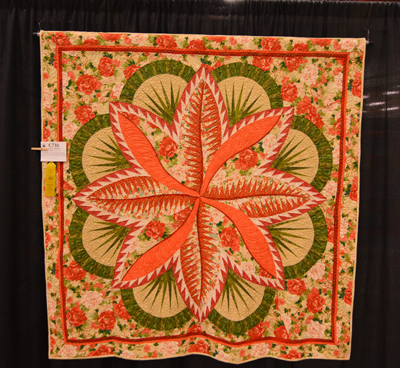 These quilts are better in person, but for those of you that are like me and are challenged to spend a lot of time at a quilt show or even get to one, I hope you enjoy these snippets. 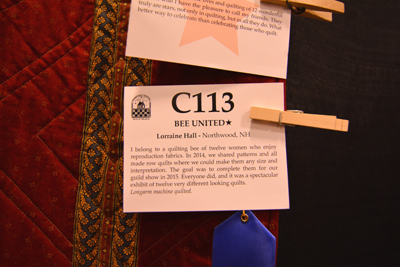 Each quilt pictured is followed by a picture of their entry number and quilter to give credit where it is due. 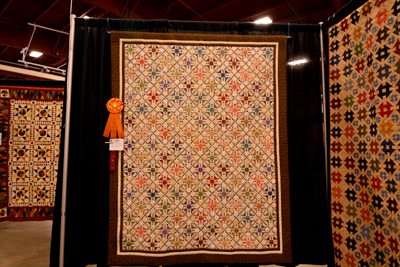 I only dream of making such beautiful quilts, but keep working to that end...Maybe someday!? This year did not disappoint us, except for what we believed to be its shrinking hours on Sunday? 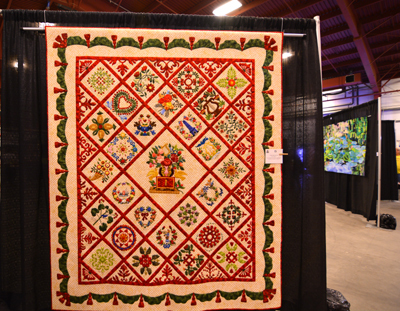 It is always the last weekend in June, for those of you that want to take in this wonderful quilt show next year. 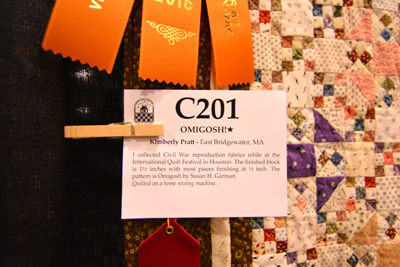 It is located in Essex, Vermont and it is posted on line each year, so that you can plan in advance and make reservations for the many quilt classes featured by well-known quilters! People come from Canada as well as the surrounding states to "take it in". 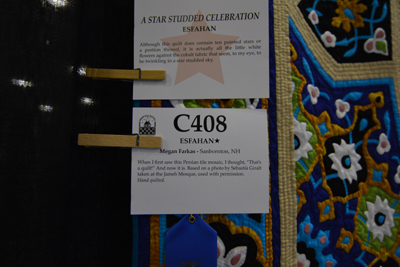 It is supposedly the largest quilt show in the East. 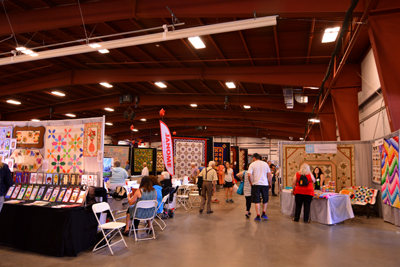 Largest or not, it features beautiful quilts and great vendors that surprise us each year with wonderful selections of fabrics, patterns, notions, machines, and threads. There is something in this show for everyone, and I am not being paid to say this!! It is truly the place to be in late June. We are grateful that they moved it to The Exposition Center in Essex Junction years ago, as air conditioning makes it a truly pleasurable event!! Here are but a few of the four-hundred pictures my husband took. Enjoy! 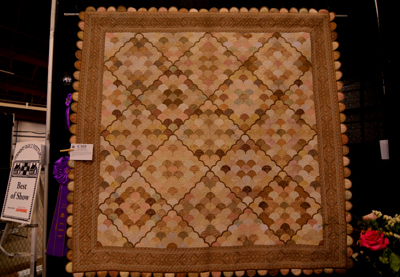 Row Quilts are becoming popular and this one was created by a challenge. 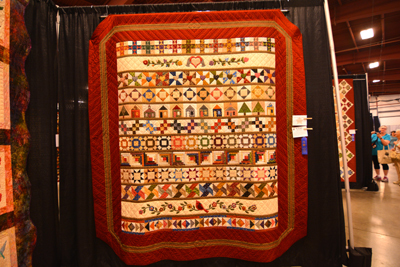 This "Row Quilt" is by Lorraine Hall and was made for a local quilt show. 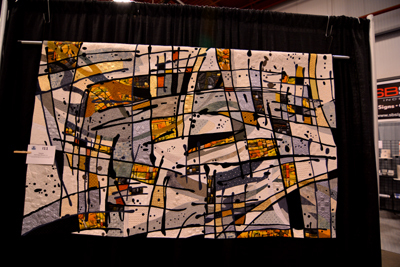 The texture of this quilt was amazing (see below)! It is long-arm quilted. Needle turn and reverse applique, paper-piecing and embellishments used. 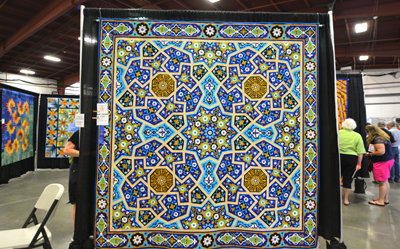 Persian Tile Mosaic turned into a quilt!! Amazing or what!? 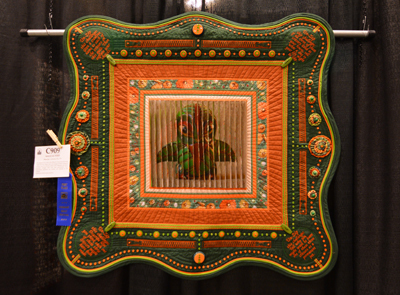 This quilt is by Megan Farkas, Sanbornton, NH. What a beauty!! 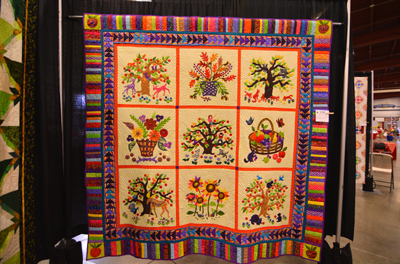 This bright harvest quilt is made with Kaffe Fassett fabrics! 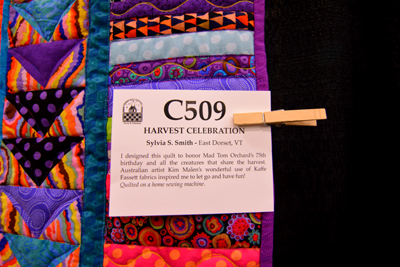 Quilt by Sylvia S. Smith, East Dorset, Vermont. I want to try this but will I live long enough? Each tiny block = 1 1/2 inches! This Omigosh Quilt with thousands of pieces is made by Kimberly Pratt! 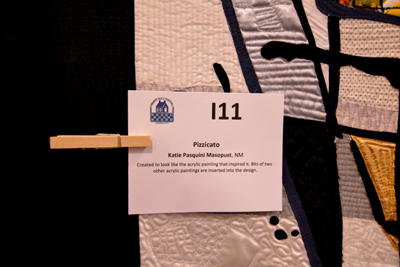 Pizzicato by Katie Pasquini Masopust--NM, VQF Instructors' Showcase Quilt. Check the detail on this quilt!! Katie has much to teach quilters, to be sure! 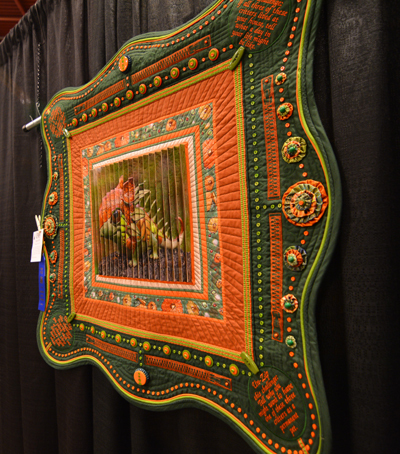 This is another quilt in the Instructor's Showcase! 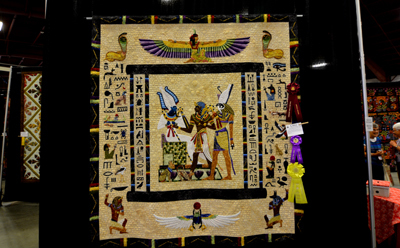 Quilt by Jackie Kunkel, CT. She is a Judy Niemeyer Certified Instructor! Is this beautiful? Oh MY!! The detailed applique work is perfect!! 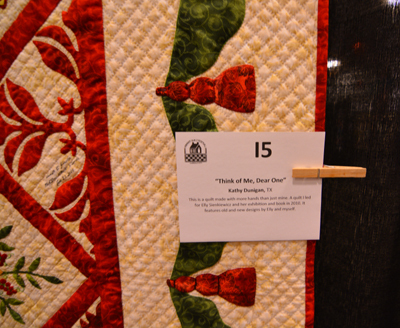 This quilt is done by Kathy Dunigan- TX. She is another VFQ Instructor! 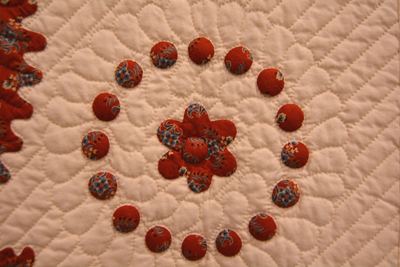 This quilt was inspired by an antique quilt at the Newark Museum. 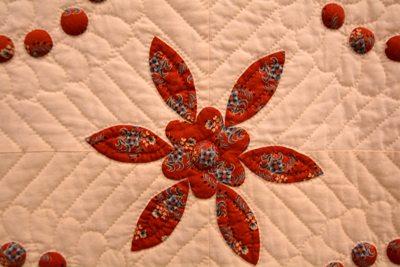 The detailed applique work is wonderful as is the hand-quilting!! Barb Vedder's work is beautiful!! 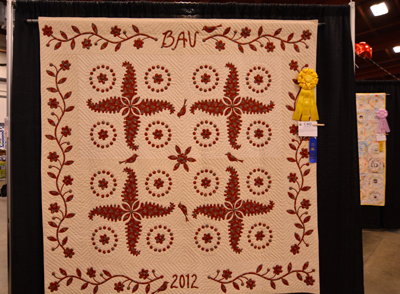 This winning applique quilt is done by Barb Vedder, Madison, CT. 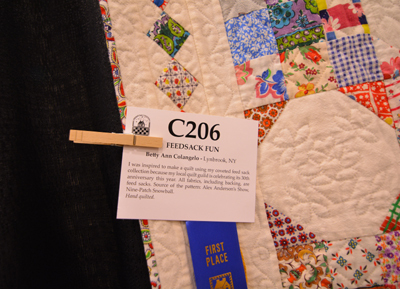 This quilt by Betty Ann Colangelo of Lynbrook, NY, is made of feedsacks. Feedsacks (rare now) used to be a quilter's best source of quilting fabrics! 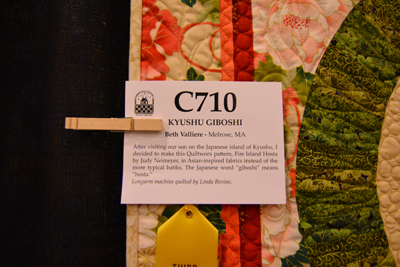 A visit to Kyushu (Japanese Island) inspired this quilt. Asian-style fabrics. 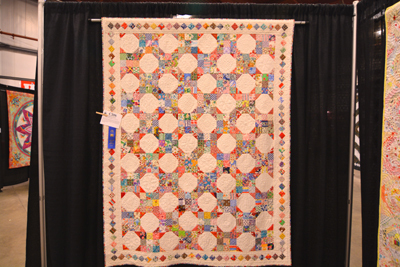 Beth Valliere of Melrose, MA made this Judy Niemeyer paper-pieced quilt. 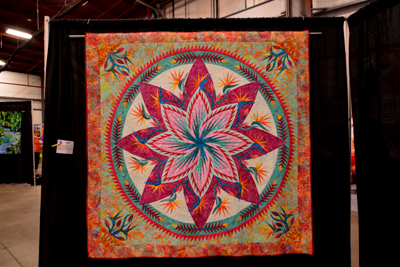 This is a Kaffe Fassett version of an old fashioned shell patterned quilt. 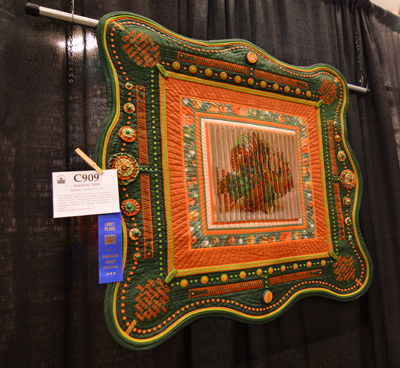 Check out Christine Wickert's (Penfield, NY) hand quilting. It is beautiful! Check the 3-D toy-design in the center;it differs depending on how it is viewed. Questions for kiddies are stitched in the corners of the quilt. Quilted on a home sewing machine! 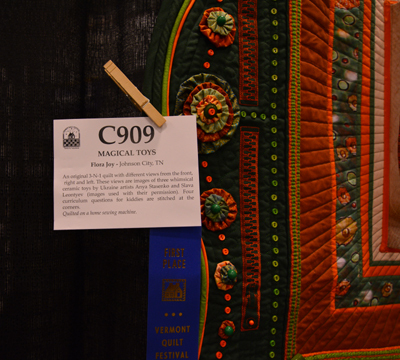 Quilt by Flora Joy, Johnson City, TN.